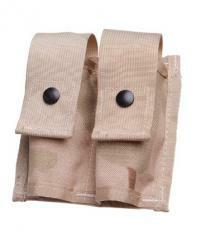 If you don't want to carry your 40 mm grenades in a claymore bag, plaster your FLC with these pouches. 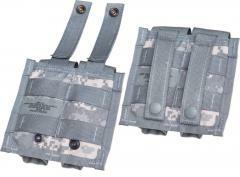 MOLLE attachment on the back, snap closure on the pouches. As with all modern US field gear, the material is very tough cordura. Aside from war use, these fit two 4-packs of 18650 batteries perfectly. 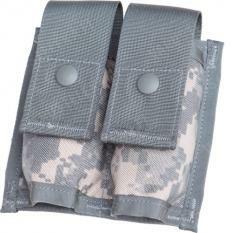 The UCP ones are usually unissued, Woodland and 3-col desert are used but serviceable.